—and on mobile devices, they’re able to connect people and businesses in new, useful and relevant ways. Today, we’re unveiling new mobile search ad formats and some new details about the ways many different businesses are benefiting from mobile advertising. 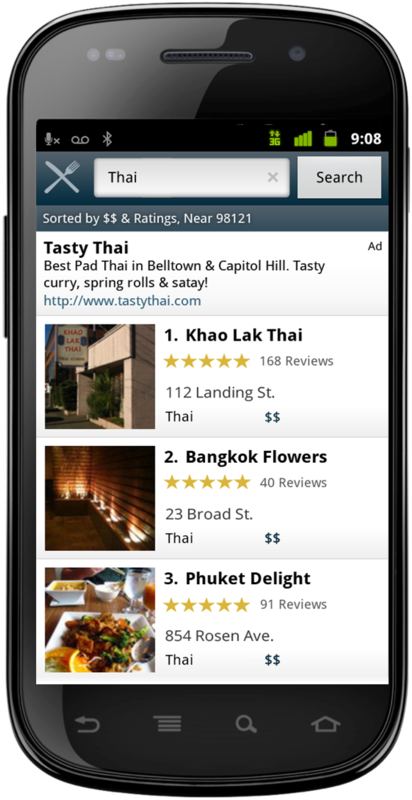 Search ads in mobile apps: Lots of mobile apps give people the ability to search for information—like an app that lets you search for a restaurant nearby. Today we’re announcing Custom Search Ads for these apps. These ads provide useful and relevant answers, for people searching within a mobile app. Custom Search Ads will also help app developers earn more money to fund their apps and grow their businesses on mobile. Click to Download: Not surprisingly, many people use Google to search for information about mobile apps. This ad format helps consumers right when they're searching for information about an app, linking them directly to the App Store or Android Marketplace to download. We’ve recently enabled app developers to include app icons and information about the app in their ad unit so that people can make more informed decisions about whether they want to download the app. Mobile App Extensions: This new, beta ad unit enables businesses to use mobile search ads to direct someone to a page within a mobile app already installed on their phone. For example, if someone searches for sneakers on a mobile device, they might see an ad that takes them directly into a cool shopping app they’ve installed on their phone. Click to Call: We introduced these ads for high-end smartphones less than two years ago and they're now driving millions of calls per week to hundreds of thousands of businesses around the world. Click to call ads have been very effective in generating leads for businesses of all sizes, across many verticals—more people can call an Enterprise Rent-A-Car near them for rentals and more potential customers can connect with ADT Security for alarm system expertise, for example. 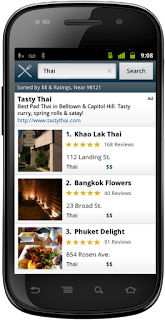 Hyperlocal search ads: Launched a year ago, these search ads contain useful local information like phone numbers, driving directions, a number to click and call a business directly, and also show people how far they are from specific business locations. Roy’s Restaurants’ efforts with this format led to a 40 percent increase in call volume—and lots more full tables! Proximity as a factor in mobile search ads ranking: The distance between a person and an advertiser’s business location is now a factor in mobile search ads ranking. This means an ad for a business with a physical location close to to a consumer may perform better in AdWords—driving more mobile traffic at a lower cost. The feature will be effective only when consumers opt in to share their device location for mobile searches. It will make our hyperlocal format more useful for businesses and users—advertisers can get started with this by creating Location Extensions for their mobile campaigns. Particularly this holiday season, when consumers are using their mobile phones to find a nearby store for last minute gift purchases, this new feature will help connect customers with storefronts. 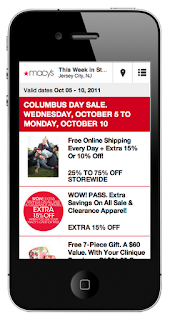 Circulars: We began testing this new ad format with Best Buy and Macy’s earlier this month. When someone clicks on a search or display ad (on desktop, mobile or tablet devices), they may see these engaging ads which contain photos of relevant products and special offers. With a few simple clicks, people who are at their desk can email that circular to their mobile phones, and later walk into their local store, flash their phone and redeem the offers. The exciting thing for mobile users and businesses is that the possibilities for mobile search advertising are nearly endless. We’re looking forward to helping businesses and consumers alike take advantage of this brave new (mobile) world. Mobile search helps people find what they need in a snap. Whether they’re choosing between two restaurants, shopping for a new watch, or buying a movie ticket, people make better decisions when they have access to more information. Search ads are information—answers—and on mobile devices, they’re able to connect people and businesses in new, useful and relevant ways.